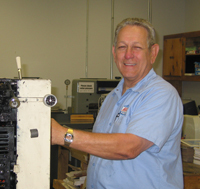 Mike brings 39 years experience in the printing field to our operation. After working in all aspects of the newspaper business for 23 years he started his own family print shop in Roanoke Rapids. Family considerations brought him to Richmond and Atwood's Printing is pleased to have him as a great member of our team.